Houston news outlets are reporting a four vehicle accident at a Beltway 8 toll plaza around 11:00 a.m. this morning. 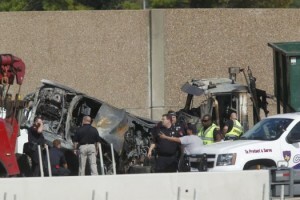 Two people were killed and several others injured when a Global Waste Services tractor pulling a dumpster trailer crashed into an extended cab pickup truck with four occupants, and then struck a gold-colored Honda occupied by a Precinct 4 Deputy Constable and his wife. 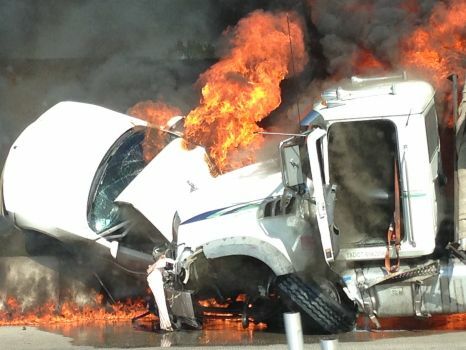 After striking the pickup and the gold Honda, the Global Waste Services truck then collided with another pickup truck waiting at the toll booths; the dump truck then hit a concrete retaining wall and burst into flames. 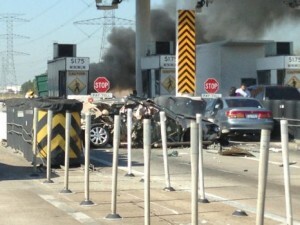 The driver of the Global Waste Services truck and the driver of the second pickup died at the scene. The deputy constable, his wife and two of the four people in the extended cab pickup (the first vehicle that was hit) were transported to hospital. According to Channel 2 News Houston, the deputy constable’s wife’s injuries were serious and his injuries were relatively minor. 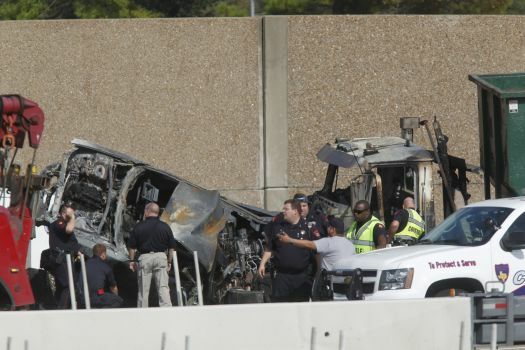 This entry was posted on Friday, November 15th, 2013 at 10:29 pm and is filed under 18-wheeler accidents, Auto Accident, Wrongful death.